Five and a half years after the Canadian Radio-television and Telecommunications Commission made that statement in approving two new FM stations in Montreal, there are still people finding holes on the FM band to fill with low-power stations or stations in Montreal’s suburbs. The latest is an application published on Wednesday for a low-power FM station carrying mainly Tamil programming. The station, at 102.9 MHz, would essentially be a migration of an existing service that operates on a subcarrier of CISM-FM. Before that it was on a subcarrier of CKUT-FM. Subcarriers are great because they can piggyback on existing stations, but they require special receivers to listen to. And that’s the problem that AGNI Communications Inc., owned by Phillip Koneswaran and Jenoshan Balasingam, is trying to overcome. According to the brief they submitted with their application, a younger demographic is more mobile, and the special receivers aren’t built into car radios. To them, getting on FM, even at only 50 watts, is a better way to reach their audience. For those familiar with the existing service, it will stay mainly the same. The proposal is that more than half of the programming (before 10am and after 5pm weekdays; before 10am and after 8pm weekends) will be in the Tamil language. The rest of the schedule will be filled with programming for the Sri Lankan, Indian, Malaysian, Ethiopian, Maldavian, Malaysian, Somali, Nepalese and Singaporean communities. If that seems like an obscure mix, it is. The main selling point is that these communities and languages are not served by any other radio station in Montreal. In 2011, the CRTC denied applications for three new ethnic radio stations in Montreal, mainly because they would compete with existing ethnic stations in markets that can’t handle that kind of competition. By limiting its programming to those communities not served by any existing stations, this service can argue that it’s not competing with them and there would be room for more. According to the application, the radio station would be 100% ethnic programming, with no programming in either French or English. Its programming would be mainly local, and it proposes a minimum of 60% local programming being imposed as a condition of licence, increasing to 70% in the third year. The low-power station would operate as a 50W transmitter on top of a building on Chabanel St. next to Highway 15. The signal covers Saint-Laurent, Ahuntsic, Mount Royal, Park Extension and parts of western Villeray before it starts hitting interference from other, much more powerful stations (the shaded areas above). CHOC-FM-2 St-Jacques-le-Mineur (34km away): This retransmitter of the French community station southeast of Montreal would not receive any interference in its current pattern, but at its theoretical maximum it might get some interference in a sliver around Candiac and La Prairie, most of which it would see interference from anyway from another station on the same frequency. CFOI-FM-1 Saint-Jérôme (42km away): This retransmitter of a Quebec City-based Christian station would not receive any interference in its primary pattern, which covers a radius of about 20km. In fact, you wouldn’t have to get far from the Montreal station before you start hearing this one instead. CITE-FM-1 Sherbrooke (102.7) (113km away): This 100kW Rouge FM station has a huge pattern that reaches into the Montreal area, and will be the primary cause of interference for this new proposed station. 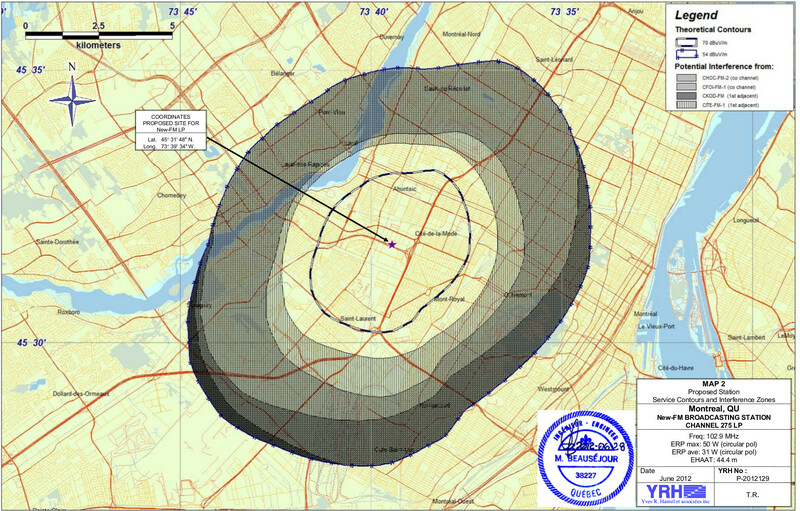 Only a tiny sliver of the station’s coverage area of more than 30,000 square kilometres could be affected by interference from the new station, and the technical brief says the protection for stations of that class is limited to a radius of 86km, where there would be no interference. And it’s kind of a moot point practically because people in that area (roughly downtown Montreal) would be listening to Montreal’s Rouge FM station anyway. CKOD-FM Valleyfield (103.1) (45km away): Though closer together, this station and the proposed one would not interfere with each other to any great extent. CHAA-FM Longueuil (103.3) (9km away): This Longueuil community station, whose transmitter is actually on the island of Montreal, is far in frequency from the new proposed station, but is physically very close. The technical brief nevertheless shows no interference between the two stations. The analysis also includes stations even further away in frequency, CKRK-FM at 103.7 and CINQ-FM at 102.3. The first won’t cause any issues because of its distance, and the station has promised to resolve any interference issues affecting the second. The financial projections for the station are modest: $120,000 a year in revenue, increasing steadily to $300,000 by the seventh year. The first-year projection is perfectly reasonable, since it made that amount in 2011. Whether they can double that in five years is another story. Operating expenses would be even more modest, going from $76,200 in the first year to just over $100,000 in the seventh. This means the station would be making a profit already in its first year. The cost of actually setting up the transmitter is only $20,000. The CRTC has called a hearing for March 20 to consider this application (the same hearing at which it will consider an application for a French sports-talk station at 850AM). Unless significant objections are raised, a presentation by the applicant will not be required at the hearing, which will take place in Gatineau. People wanting to comment on the application, or express support or opposition, have until Feb. 15 to do so (this includes other broadcasters who might oppose the station for technical or programming reasons). They can do so by clicking here, choosing Option 1 and then 2012-0821-5: AGNI Communication Inc.
After the hearing, it’s up to the commission to decide when to come to a decision and what that decision will be. Its too bad the FM dial is so jammed up in the Montreal area, and new applicants have to squeeze into small holes with low powered transmitters. How many services are actually licensed to use the subcarrier of other stations in the Montreal area? I’ve never even scene a FM radio that offered access to the subcarrier. What do these things even costs? HD Radio (FM/HD Radio) is an answer that already exists for multicasting. Receivers for both home and cars are available. Including portable models. Unfortunately I can’t find a list, nor do I have the proper receiver, but CISM-FM, CJPX-FM, CFQR-FM and CKUT-FM have had them (or at least had licences to use them), and one was just recently approved for CIRA-FM. The services that became CHOU (Radio Moyen Orient) and CJRS (Radio Shalom) began as SCMO services. About the same as a regular radio. You can get them for about $20. HD Radio (FM/HD Radio) is an answer that already exists for multicasting. Receivers for both home and cars are available. Including portable models. That’s true. But HD radio is expensive to set up (requiring a separate transmitter), and would require everyone who already has an SCMO receiver to throw it away and get a new radio. That might not be such a fantastic idea to some people.